PUNCH! Painting, sculptures and drawings by Olivia Bax and Dominic Beattie at Linden Hall Studio, Deal, Kent! Full collection of images exhibited in the exhibition Transience, in Linden Hall Studio, Deal - 25/6/19-13/7/19. Linden Hall Studio is a contemporary Art Gallery situated in Deal, Kent. 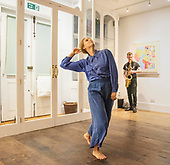 Last night saw their first outreach show in London, at the invitation of The Building Centre. A show featuring some of the most exciting, dynamic and engaging established artists that have exhibit within the gallery in the just four years it has been open. Bringing a breath of seaside air to a culture starved metropolis! Linden Hall Studio, Deal, Winter Show 2017. The eatures professional and emerging artists from across the South East of England and beyond. The studio in the coastal town of Deal, Kent undertakes the design and manufacture of new commissions, the conservation and restoration of historic stained glass in ecclesiastical buildings, historic secular buildings and private collections. 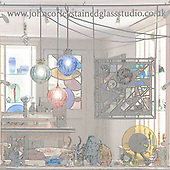 John Corley Stained Glass Studio was established in 1978 following John’s studies at Canterbury School of Art and training at the newly established stained glass studio at Canterbury Cathedral.